We offer our clients cutting-edge, in-office genetic testing. Developed by world-renowned researchers, this comprehensive test consists of 45 genetic markers that are used to compile your unique genetic profile. We test for 45 genetic markers related to several important aspects of your lifestyle including weight management and body composition, nutrient metabolism, eating habits, cardiometabolic health, food intolerances, and physical activity. Schedule an appointment to come in for your simple, in-office saliva sample. The lab receives your sample and your DNA is analyzed. In about 2 weeks, we receive a detailed booklet with your personalized results. 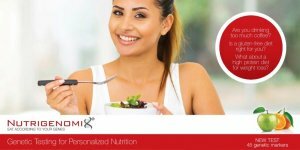 We review the results and work with you to formulate an eating plan based on your unique genetic profile. The cost of the test is $398 (not covered by insurance). Your visits with your dietitian nutritionist for your personalized nutrition plan may be covered by insurance. 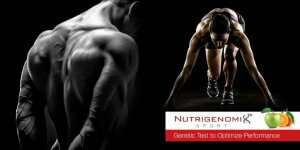 We offer 2 reports: Nutrigenomix Health and Nutrigenomix Sport for athletes.